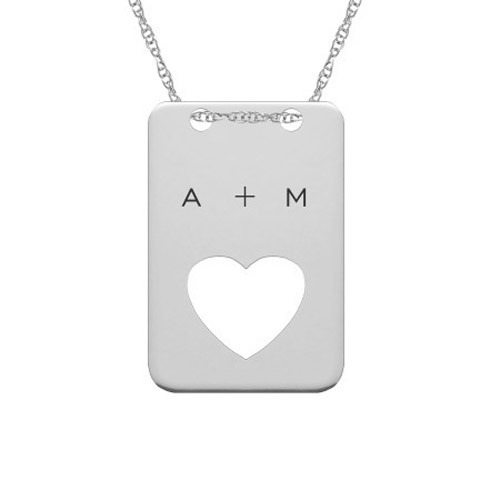 Give your loved one a piece of jewelry that is unlike any other in their collection with this personalized cut out heart dog tag necklace from Apples of Gold Jewelry. Available in your choice of 10K or 14K white gold, this necklace has a dog tag shape design with two holes at the top for the included 18 inch chain, allowing the pendant to lie flat. The pendant measures 21mm by 13mm in size (0.82 inches by 0.51 inches). * You can personalize this with up to 8 characters, including spaces. We guarantee our Personalized Cut-Out Heart Dog Tag Necklace in White Gold to be high quality, authentic jewelry, as described above.